Pipeline applications involve the installation of a non-metallic pipe section that sends product through a metal detector for testing. Pipeline applications are used where the extra sensitivity of a small aperture outweighs the benefit of final package inspection. Pipeline Metal Detector are ideally suited to inspecting liquid, slurries, or paste products that can be pumped through a pipe. Such products would include sauces, dairy products, meat slurries, mayonnaise, juices, etc. Pipeline detection system relies on many critical factors, including the Internal diameter (“ID”) of pipe, pipe clamp connection style (tri-clamp, I-line, Union, etc. 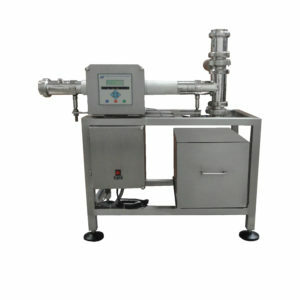 ), product flow rate (GPM), product viscosity, product temperature range and product pressure. The position of the reject valve relative to the detector depends on the product speed. The distance between the valve and the detector must be increased in direct proportion to the product speed and valve response time, since the valve has a minimum divert response time. 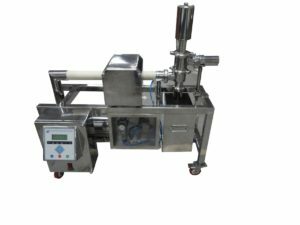 Non- metallic food grade pipe is selected depending on the required connection style, product temperature and the flow rate of material pumped. Hygienic design with watertight protection. Contact parts of Food Grade Pipe & Stainless Steel 304/316 grade. TFT Touch screen with color LCD display available (optional).